The 1800 (left) has longer threads and is designed for the rear tire. The 1740 (right) also has a shorter spike on top. Both use a two-prong driver. Nothing is more frustrating than sitting around the house during winter while skiers and snowboarders have all the fun. Snow and ice make for difficult off-road motorcycle conditions and many riders choose to park their dirt bikes once the white stuff starts to fall. Every year we’re a little less willing to brave the cold and slip-slide our way around treacherous mountain single-track. 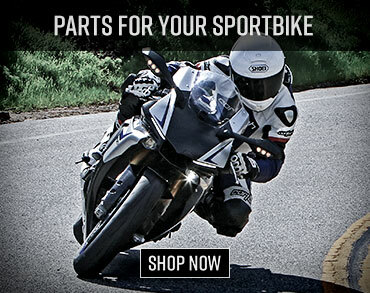 Fortunately, there are some new products that help extend the riding season. Grip Studs manufactures extreme traction studs for everything from heavy equipment to hiking shoes, including dirt bike tires. The company located just a few miles away from MotoUSA in Merlin, Oregon, so we ordered a set and used them until the spring thaw. There’s a learning curve on how to properly install, where to put the studs, how many to use and which style is best. Hopefully this review helps readers avoid some of our mistakes. 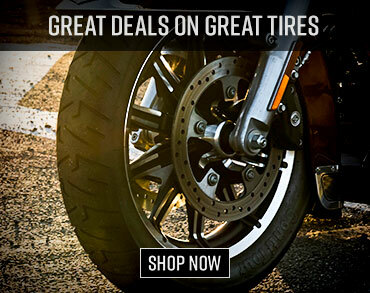 Four styles are recommended for rear motorcycle tires and two for the front tire. We ran the 1800 out back and coupled it with the 1740 on the front. Price on the studs is all the same – they’re basically a buck apiece. Our 150-count stud packs retail for $149.92 on the front and rear. The installation tool is another $9.95 and uses a hex-head shaft that slips easily into a drill chuck. We used a cordless drill for easy handling. (Top) Using a worn-out tire results in this. We had to pull all the studs and start with a fresh tread. (Bottom) Tires like IRC, which are known for extra-deep lugs, are recommended. Notice the damage to the concrete floor simply from spinning wheel lightly during installation. Our first thought was that we could get some extra life out of a used set of tires by adding the Grip Studs. It turned out fine for the front, but on the rear we poked the razor-sharp thread into the tire cavity almost all the way around the tire. Obviously we were flat and had to extract all of the studs. This added some significant time in the shop. It takes about 30 minutes to install and roughly half as long to pull them out. Also, the installation tool is a weak link. It uses two prongs that fit into matching grooves in each stud. The driver is made out of soft metal and we stripped out the prongs during the removal. The driver needs to be bulletproof so riders can pull out studs and move them around as needed to tailor the level of traction. We called Grip Studs to sheepishly request another driver and they just laughed. Apparently punctured tubes are a common error on first-time installs. They had a replacement driver in the mail within a day and recommended we start with a tire that has larger-than-normal lugs just to be safe. We selected the IRC M5B soft terrain rear tire and installed a few studs before putting the tire on the rim to make sure things were fine. After about a dozen we spooned on the tire and finished installing studs with the wheel mounted. It’s more stable and easier when the bike is on a stand and the wheel can spin freely. Once the snow melted we simply took off the whole tire and stashed it away for next year. This isn’t necessary, but it’s much easier than pulling out all the studs. Changing the tire with studs installed is a little intimidating, but it doesn’t shred the hands and knuckles any worse than usual. It was apparent right off the bat that not all 150 are necessary for our mixed terrain. Without knowing any better, we screwed all 150 into the front and rear to start with maximum grip. Believe it or not, there was a bit too much traction and it affected normal handling of the bike. Our riding area has snow in the upper regions and regular muddy trails down low, so we got to sample the traction in a wide variety of situations. Next time we’ll start with a 100-count pack to tone it down and shave some costs. The Honda CRF250R is a great motocross bike and competent off-road crossover, but the 250cc engine struggles with so much traction which meant removing some studs. We haven’t tested them, but Grip Studs also makes spikes for ATVs like the 2012 Kawasaki Brute Force 750 EPS. The front tire was immensely improved on ice and snow, even with rocky terrain underneath. It’s also more resistant to slipping out from underneath the rider when hitting a root or log at an angle. However, it grabs so well with the side knobs that it likes to climb out of ruts. This led to a lot of cross-rutting and made hillclimbing more difficult when we wanted to drop in a groove and use it like a slot track. Removing some of the studs from the edges helps. After learning our lesson with the used tread, the IRC M5B was a bit of overcompensation. The deep lugs combined with the studs are simply too much for our 2011 Honda CRF250R project bike to push around, even with a Two Brothers Racing V.A.L.E. M-7 slip-on exhaust installed. A 450cc bike would have no problem. This meant taking out some of the studs to lighten the engine load. It also solved a handling issue. One of the things we love about riding 250 4-strokes in the woods is their quick steering, and brake sliding into corners is necessary to set up particular turns. It’s nearly impossible to do with studs on the rear. Taking some off the side knobs frees up the rear end to move around, and it was worth the tradeoff in hard acceleration. Studs aren’t unstoppable. We still managed to get hung up on some slimy roots that pounced from the depths of a nasty rut. Still, getting unstuck is much easier and the studs give an amazing amount of confidence when tackling log crossings. Stopping to inspect these wooden obstacles shows what look like buzzsaw marks – these things are gnarly! Basically the issues we had were growing pains. Once sorted out the studs last a long time, offer insane levels of traction and perform as promised. The only actual flaw we could find is the installation tool. Our studs can easily handle another year, and with our three-month window of use, we’re expecting more like an additional two or three seasons. This longevity helps justify the expense. Grip Studs aren’t exactly cheap, especially if a new tire is needed to begin with, but the fact that they are removable and can be used with a rider’s favorite tread pattern gives them extra value in our book. 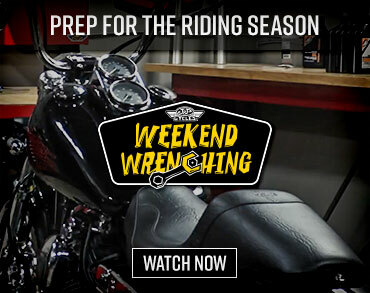 This is the hot ticket for cold-weather riding.